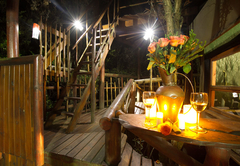 Teniqua Treetops is a 3 star graded property offering Sedgefield accommodation for tourists and visitors of on the Garden Route. 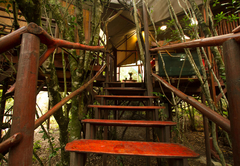 Teniqua Treetops invites you to a luxurious, eco-friendly, eccentric treehouse holiday hideout. 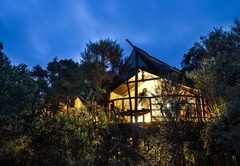 The resort is very child-friendly, while the treehouses are private and far from one another making it an ideal romantic honeymoon destination. 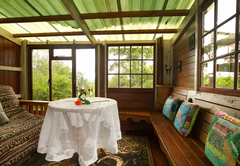 Set in acres of pristine indigenous forest, Teniqua Treetops offers you an experience that may be quietly life-changing. 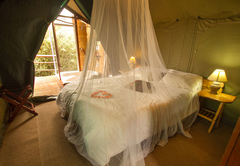 As your body slows to the rhythm of the African forest, your mind will get its chance to unwind and let go of the stresses and anxieties of city life. 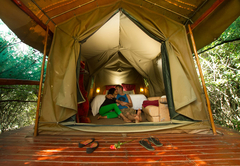 A holiday with us will relaunch you on the world relaxed, reinvigorated and rejuvenated. 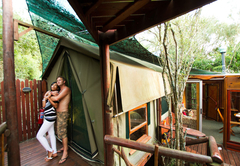 Teniqua Treetops offer a unique opportunity to sleep, eat and shower up in the forest canopy, surrounded by birdsong. 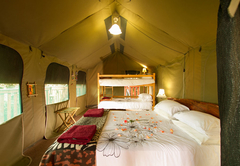 Built on handcrafted platforms and situated in carefully chosen beauty spots, they have comfortable tented bedrooms, fully equipped kitchens, leafy luxury bathrooms with an inside and outside deck area. 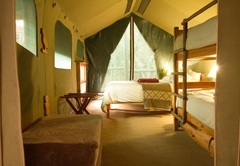 They are private, tranquil with spectacular mountain and gorge views. 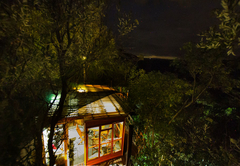 All treehouses are serviced daily. Electric blankets allow you to snuggle up on those rare cooler winter evenings. 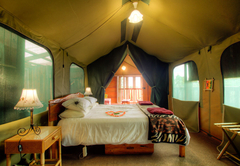 A wheelchair friendly unit is also available. 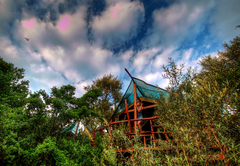 There is a great entertainment area with pools, trampoline, jungle gym and an indoor conference and games room. 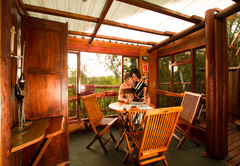 Chill out on the wooden deck of our swimming complex perched high on the hill, the converted farm dams and balancing beam are fun for both kids and adults. Adjacent to the pools is a fun entertainment area, for those more social times. 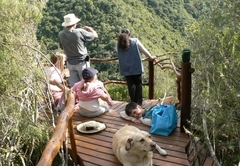 Teniqua Treetops is situated along the magical Garden Route, at the foothills of the ancient Outeniqua Mountains. 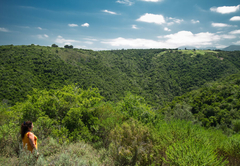 The area is virtually crime-free. 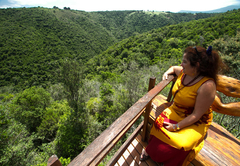 We are 30 minutes from Knysna. 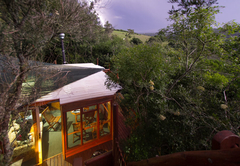 20 minutes from Sedgefield and 15 minutes from the beach. 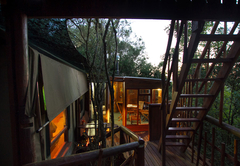 All our 2 sleepers are romantic honeymoon tree houses, they have wonderful views, large 2 person baths looking into the forest, very private and tranquil. 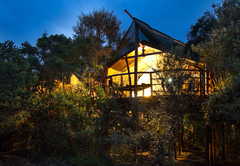 These tree houses have one bedroom with a queen and a bunk bed plus a single bed sleeper couch. They are designed to be toddler friendly. 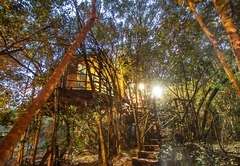 This tree house has 2 separate bedrooms one with a queen bed and the other 2 singles plus a single bed sleeper couch. Such a lovely setting! We had a wonderful time. 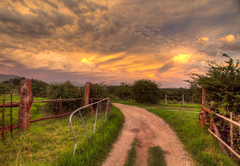 This place is really great; a little slice of paradise!! We had so much fun in the pool, shooting each other and fighting on the balancing beam. The river walk was great. 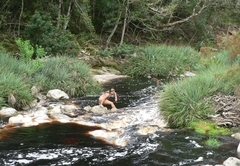 Beautiful scenery and had a ball in the rock pool. 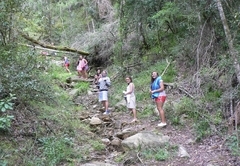 It was abit hectic but really enjoyed it. 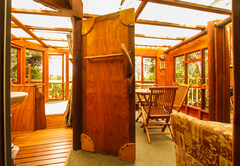 The treehouse is fantastic with excellent craftsmanship. Couldn't get enough of the shower. And the hospitality was superb. This is a super-doopa-fun-fulled-place! 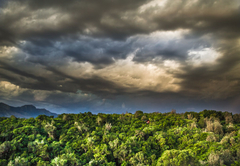 Response timeTeniqua Treetops typically responds to requests in 5-10 minutes.